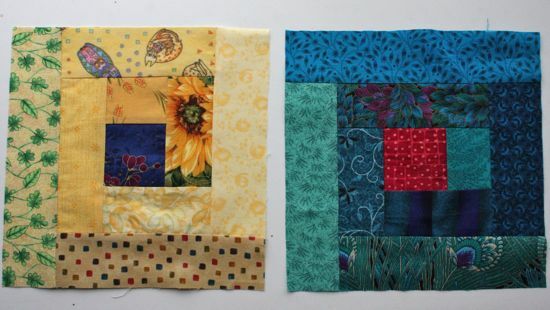 I have managed, just barely, to get my blocks for the Sew.Quilt.Give. Bee done and mailed off before running out of time. I've been much more behind when it comes to posting them. These were August's blocks. We used this tutorial and were supposed to use a "muted" palette. Nothing quite like specific color requests to point out the holes in my fabric stash! I think these are more muted in reality. At least I hope so. 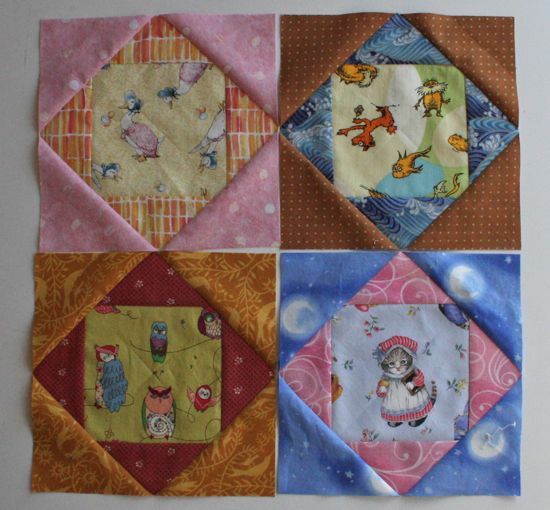 Jenn recently posted the finished quilts from June, a baby quilt for a girl and for a boy. The quilts came out great, but my blocks don't mesh well with the others since they were so saturated. For September, we did scrappy log cabins a la this tutorial in "bright jewel tones". I think my stash has more of those colors but now I'm just a little worried. Language can be so inexact when it comes to color! I love all of your blocks! I'm sorry to have made you so much trouble. For me as a not native speaker it's even harder to get what is meant by the colour description. PS: I just figured from your last post that you've lived in Germany. That's great! Thanks for the links! I'd heard of XKCD's color survey but hadn't looked at the results. And don't worry - I'm crossing my fingers that I got closer with your blocks than I did with the first set. I *really* have to remember that I'm a bit of an outlier when it comes to colors for babies. When I was expecting Caitlyn, I read somewhere that babies have an easier time seeing bright, high-contrast colors than the soft pastels we adults often associate with babies. So, when I think "baby quilt", I don't automatically think of the soft colors, which is why my blocks from June don't really mesh well with all the others. And your English is way, way, way better than my German!